This one is from my daughter. I was putting away a glue stick and complained aloud about how they always get dried up before they're used up. My daughter simply said, "why don't you put them in a plastic bag?" Yes, why don't I, brilliant daughter?! A simple solution staring me in the face, but I never thought of it. So, my 2 new glue sticks for this year. I put them in a freezer bag, forced all of the air out, sealed shut and rolled up tightly. Hoping this will keep these glue sticks usable for their entire contents. Maybe next year, I won't have to buy new glue sticks! I don't know if this will work with really, rock-hard, dried out glue sticks. But with glue sticks that still feel flexible, but just won't lay down a strip of glue on paper, this worked for me. I had two, older, semi-dried out glue sticks that I revived. I took the caps off, and put them in a plastic baggie with a damp paper towel, then sealed the bag up. I left them on the counter for 24 hours. And voila, they were good as new. These glues sticks wouldn't leave a streak of glue on paper before, but now are working just fine. My plan is to just keep all of my glue sticks in a sealed bag. They won't get misplaced, and will hopefully get completely used up before they can dry out. I likely won't need to buy new glue sticks for a couple more years, now. It's not a small thing....these are the savings that will add up over time. 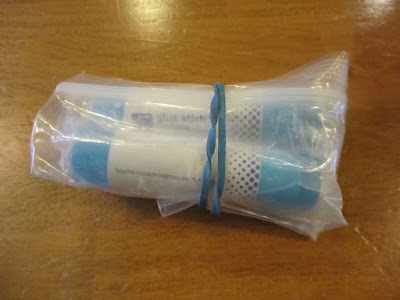 From now on you will always keep your glue sticks in a freezer bag, it isn't much more difficult to do that. And it is wonderful when children grow up to be so wise and capable that they exceed us in many ways. Yesterday, I also had a brilliant discovery. I realized I could save half a cent per baggie if I used the fold over vs the ziploc style for some uses. I don't usually buy the old style sandwich bags, so out of habit I used Ziploc to break the industrial sized can green beans into portions for freezing. I calculated it is cheaper to do this than buy individual cans. This is for my dad who likes his foods soft anyway. I have a lot of twist ties gathering dust, and I cut the twist ties into half anyway. I can't use reusable containers because he never returns it to me promptly, and there are just too many things I freeze for him that it is easier if the containers were disposable. Good idea on the plastic baggies, especially if the foods will be used soon. I use the thin baggies, as Sara does for a few items that I separately bag, then place all smaller items into one larger bag, like pie dough. And when any of my baggies develop zipper problems I just use a twist tie. A lot of people don't want to wash out the thin baggies, but it is doable, especially if the contents weren't to messy/greasy. Washing baggies is one person's job in our house on Saturday mornings. I save them all on the counter, off to one side, throughout the week, then they all get washed at once. It's not very many for a week, maybe about 3 or 4. I do mostly use reusable containers as they can just go in the dishwasher. But I understand completely about containers not getting returned promptly. Happens, here, too. I save and wash the thin sandwich zippered bags too, but keeping track of those bags and getting it back from my dad will not happen either. So I tell him to throw all the wrappings away, don't save anything. Otherwise I find the dirty Ziploc in drawers and containers in his fridge with dried out foods. He never bothers to cover his foods. What a good idea! We haven't used glue sticks in years but I'm certain there are some somewhere in the house. I'll do a look around and see if I can find some just to give this a try! YHF, I also have a huge container of the folder over bags that I've had for years. When the kids were still packing lunches for school they never could figure how they worked (really?!). I always use a washable container for my food and so does my daughter so I'm at a loss as to what to do with them. They're really not freezer sturdy so I don't use them for that. I'm up for ideas! I've started packaging single-meal portions of food (usually cooking for two most meals)into fold-over bags first (either folded, or twisted without a twist tie, depending on the type of food); and then put all the little serving size bags into one zipper freezer bag. It makes it easy to take out one serving. It takes up less space than my stackable plastic boxes. It makes it easy to keep track of all the little serving bags, and also to monitor how much is left of that particular food item. And it keeps the big zipper bag cleaner and easier to re-use, especially from fatty or meaty products. Lili, brilliant idea of your daughter's. I'll have to tell my friends with kids! No, Sara it's not that you were sleepy....sometimes I can't find the right words to explain myself...My husband always tell me that I don't make myself clear. Yes, just as you described, I am thinking about bagging canned green beans content in those fold over style sandwich bags with twist tie. I understand Alice's concern that those bags are not made for freezing, and I like your idea about putting the baggies (in fact wasn't there a brand named "Baggies"?) in a large freezer bag. I do it for Saran wrapped potions, to keep them more airtight and to help with labeling all the little bundled portions. BUT...my dad will eat all this up in a week or two, so I don't think it is there long enough to suffer freezer burn. I have three cardboard boxes in his freezer to organize what goes where, because he fumbles too much with the zippers on the bags often leaving them wide open. However, Sara, I think your suggestion is a good one for Alice!! Since we're talking about freezing in bags, to save money and help with labeling, I write the contents and date on a scrap of paper(the cut sides and ends after clipping printed coupons) instead of marking the freezer bag or using masking tape on the bag. That way I can just wash the freezer bags and not have to worry about the labels. Nice chatting...have a good day! I use glue sticks from time to time, making greeting cards, or when out of tape, for wrapping gifts. But I don't use it often enough to use a whole stick very quickly. I would be interested to know if putting them in a bag with a damp paper towel works with the very dried out ones, if you happen to find some around your house. It worked with the semi-dried out ones (the ones that look like they should work, but the glue is too dried to make a streak on paper), but I don't know if really dried out ones can be rescued. Those thin baggies can also be doubled up for individual items, that you would want to throw out the bag after 1 use, like lumps of ground beef. I've used one right inside of another for that purpose. They're also good just to hang onto for outings, taking snacky foods like popcorn, to the park in summer, or or breaking up a larger bag of potato chips into individual bags, also for outings. We do a couple of picnics per summer in our family, at least one to a local park and another to the beach, and having the individual bags of chips/popcorn is nice. We don't always have the luxury of a large table to spread everything out on, when picnicking. When my freezer starts to get jammed with foods in containers, then the bags are the only thing left that might fit! So saving space in the freezer is a real necessity. And so totally true about how great it is to keep all of the little bags of similar foods together, in one larger zipper bag. Those thin bags do work fine for items to be used fairly soon. I found a half-banana in the freezer the other day, that was in a thin baggie. It had only been in there for about 3 weeks, so it was good enough for a smoothie. No frost on it, or freezer burn. Sorry about the typos I have a migraine today. I hope you wake up feeling much better tomorrow. Take good care of yourself. You have a smart and frugal daughter. I love this idea I am going to give it a try. The sun is out today :) we have been having unusual weather for San Diego. I wish I could send you some sunshine. My aunt is here from Oregon getting some much needed sunshine. I was happy to see your little plants popping up it lets you know spring is coming soon. Enjoy your visit with your aunt, Patti! I am sure she is relishing the sunshine. I haven't tried refreshing a glue stick before. I'll have to try your suggestion of the wet paper towel in the baggie. I wonder if that works when they get gooey which seems to happen more often than drying out with the ones I have. However, I'm sure putting them in a plastic bag will help both conditions. Hmmm, gooey. Mine go from good to flexible and pliable, but no glue left on paper, to hard. I don't know about saving the rock hard ones, but from the pliable but just not sticking paper together stage, the damp paper towel surprisedly worked. I didn't know if it would, but was so happy it did. Yeah, I don't know why I never just thought to keep them in a plastic bag. So obvious! 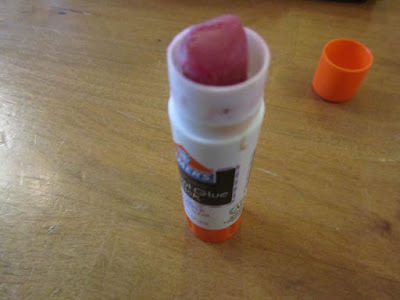 I have been known to try bringing old glue sticks back to life, semi-successfully, in the past. I would take off the cap and place them glue-side down in a cup with water in the bottom. It only sort of worked :) The baggie idea is perfect! Now that's clever, too. I never thought to use water, in any form, to refresh the glue sticks, and am so glad I did. 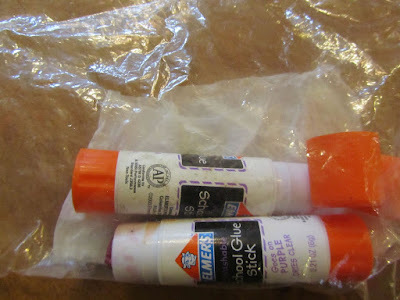 It's not a huge amount of money saved, but I just hated throwing away glue sticks every year.